Happy Halloween readers! And what better way to celebrate this holiday than with a Halloween inspired mystery!? Confession alert…..I have never read anything by Agatha Christie. I know, sacrilege. I’m ashamed to call myself a mystery/detective novel fan! For years my family has been telling me that I absolutely must read a Miss Marple or a Hercule Poirot mystery as they are all so wonderful. So when Hallowe’en Party came up on my Amazon recommendations and was only $1.99, how could I resist downloading and reading it as my Halloween read?! While the staff and children at Woodleigh Common, decorate for a Hallowe’en party, they have a famous mystery author in their midst, Ariadne Oliver. One child in particular, Joyce, quickly boasts to Ariadne that she saw a murder once. Though no one believes the girl as she has a history of over-exaggerating and at times out right lying. But she is insistent….she has see a murder but it was ‘a long time ago’ and she didn’t really recognize it to be a murder. But now that she’s older she knows now that it was in fact a murder. As the party comes to a close, Joyce herself is found murdered! She was drowned in a bucket of water at the apple bobbing station! Who would have wanted to murder a young girl? Did it have anything to do with the murder she supposedly saw? 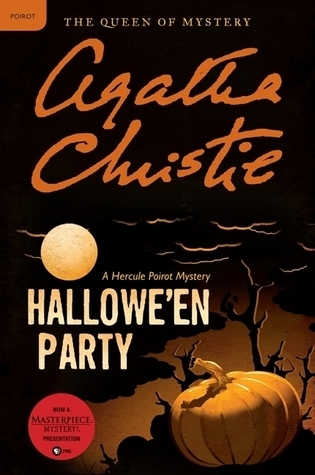 Ariadne enlists her close friend, Hercule Poirot, to help solve the murder. This was another difficult review for me. I guess I had certain expectations before I started reading. One that bothered me was that the novel was set in ‘modern times’…..well modern for Christie. I was expecting it to be set maybe at the turn of the century or even in the 1930’s or 40’s….not the 60’s (if I had to wager a guess). So the time period/setting were a disappointment for me. Another thing I struggled with, was that it seemed’dated’….before I elaborate let me note this disclaimer, I realize Christie wrote her novels within a dated era so naturally some of the ideals that were prominent in the 60’s (or any other era) would naturally influence her writing. So that said, when I was reading it was very clear that the psychology of murder was a popular, growing idea as was the concerns for the up and coming youth. There was a lot of speculation about who could have murdered the girl, and many of the theories involved something to do with madness or psychology…..it must have been a mad man running the countryside who saw a young girl through the window and for no other reason killed her because he was psychologically disturbed. I’m paraphrasing here but that’s essentially a lot of what some of the characters believed. There was also a focus on ‘young kids’ who lacked the same morals, discipline, and proper upbringing that their parents had. So there was that generational perspective which cast doubt on the ‘moral-ness’ of the characters. And then there was the focus on the victims character. Was she a good girl or a bad girl? Did she make up lies? Was she liked by others? Poirot himself said often the victims were killed because they weren’t liked by others. I thought this was an interesting approach to the murder. It almost suggested that it was her fault that she was murdered….almost. So for me a lot of the theories and investigation only looked at the crazy people, the undisciplined youth, or the victim herself. Though I felt a little let down by the period setting and some of the investigation tactics, I did like the book. It was short and a fast read. There wasn’t an abundance of fluff or back story. I loved that we got right into the murder rather than setting the reader up for a murder as some of the more modern novelists do. I enjoy this style of writing. I liked Poirot, he was quirky, eccentric, and very frank. He seems to rely on traditional methods of detection, similar to Sherlock Holmes, in that he looks for clues and logic to arrive at the final answer. But I would say his hallmark quality is his ability to get people to talk. He relies a lot on his interview skills and what people say, or don’t say. So here is the big question…..will I read more Christie? I have read a lot of reviews since I finished this book and most people agree that this novel isn’t the best Poirot novel, but it’s also not the worst. It seems that I might enjoy some of the earlier novels more than this one. I also think I might like Miss Marple since female detective novels hold a special place in my heart. So….yes I would absolutely read more by her. This book served a specific purpose for me….I was looking for a Halloween specific mystery novel that was a quick, direct, easy read and that’s exactly what I got. Did it leave something to be desired….yes, but it still satisfied my need.